As we leave the beautiful snow-capped mountains of Sun Valley, I tell Don, “Take one last look at that beautiful snow, as we won’t be seeing that again for a long while! 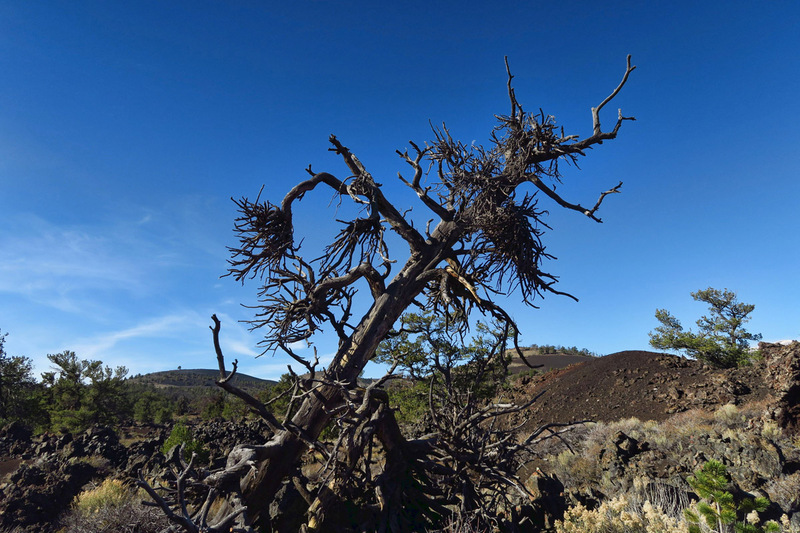 We are headed for the bowels of the earth.” In just a short, two hour drive along the Peaks to Craters Scenic Byway, I am in scenic shock. But not only am I in scenic shock, I’m in culture shock as well. 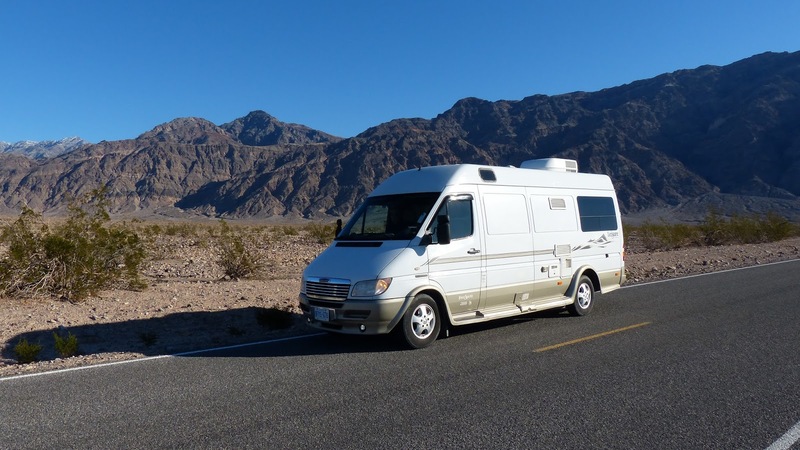 We stayed too long in Sun Valley, but I knew we only had a couple of hours drive, and as long as we made it by sundown, there should be no problem. 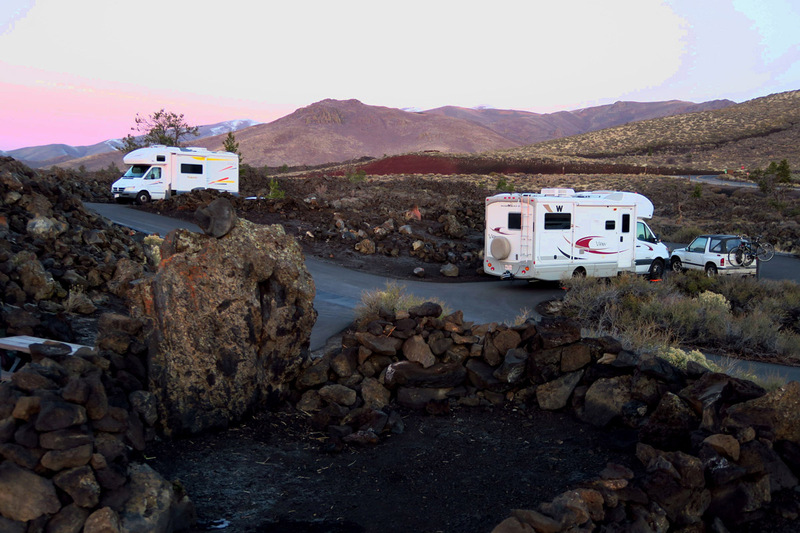 We had been the only two people in the last four or five campgrounds, so why should Craters of the Moon prove to be any different? 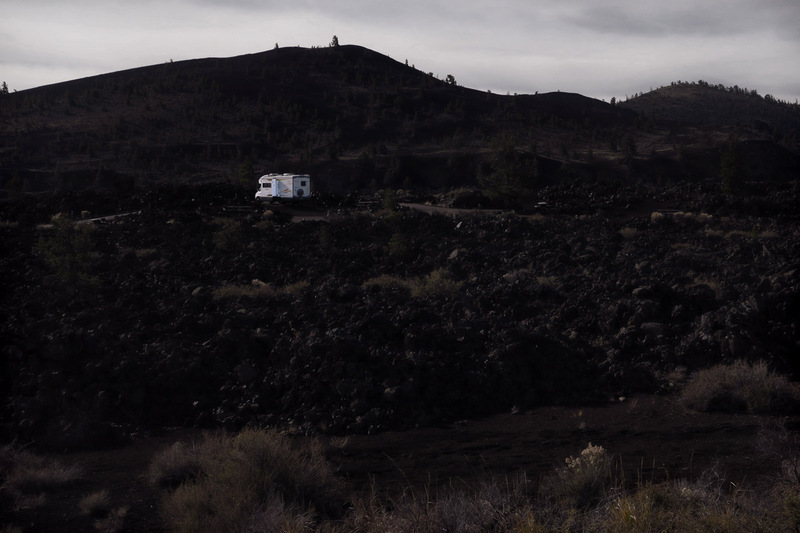 Besides, they had just finished resurfacing the 42-site Lava Flow Campground there, so all the sites should be nice and level, right? 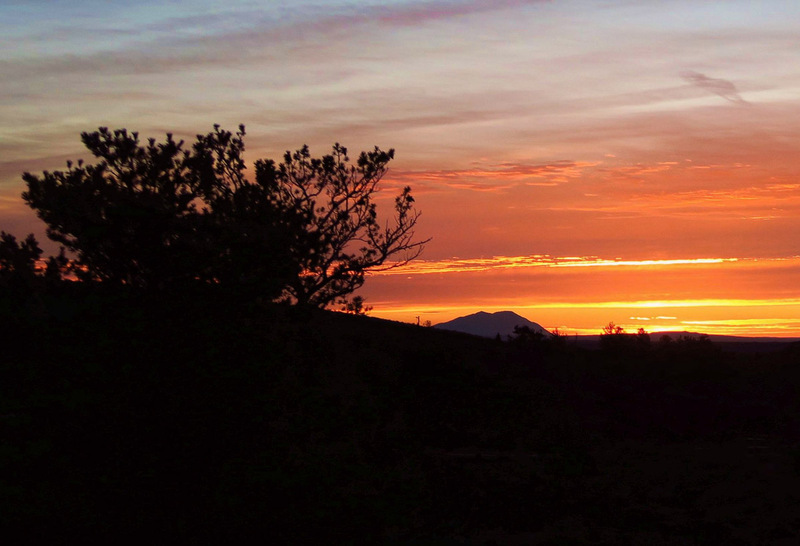 Sunset over the Cinder Cones, taken from campsite. Parking on the dark side of the moon. It’s times like these when I embrace my 24 ft Skinnie Winnie! We arrive at the campground about 30 minutes before dark, only to find all the lower, more level sites to be filled with big Class A’s, while the higher loop has carloads of Boy Scouts circling. I feel like a Stranger in a Strange Land, someone who just came in from the pioneer atmosphere of the Sawtooth frontier to find a bunch of modern day “moon rovers” walking around with Petzel headlamp beams lighting up the dark side of the moon. 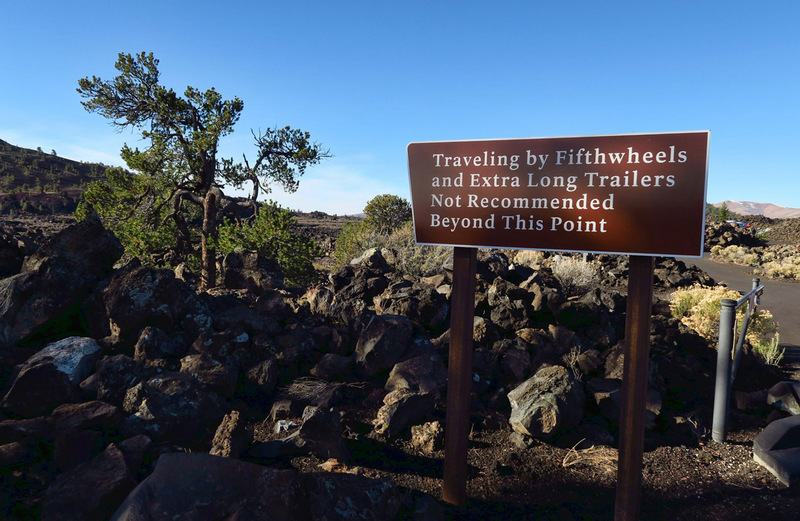 Informational signs along the trail estimate this to be one of the newest lava flows, about 2,000 years old. 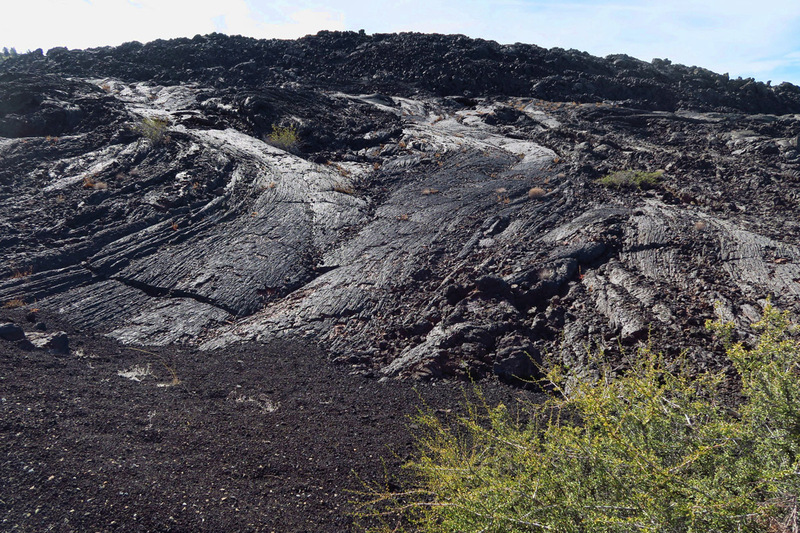 This is known as “pāhoehoe lava,” which flowed as a liquid, giving it a ropy appearance. 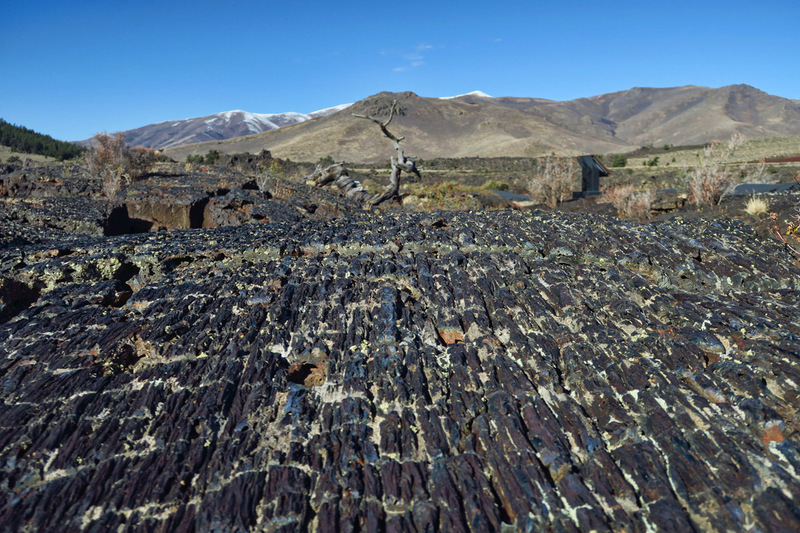 This is known as `a`a (ah-ah) lava, with a more stony and rough surface. This tree makes me think of the Scarecrow. We race around the loop to try to grab what we can.Don finds a perch high up on the ridge. I tell him “I think you would be more level down here on this lower loop,” to which he replies, “I have a signal up here.” “Okay, I’m coming up!” I had forgotten it was Friday. 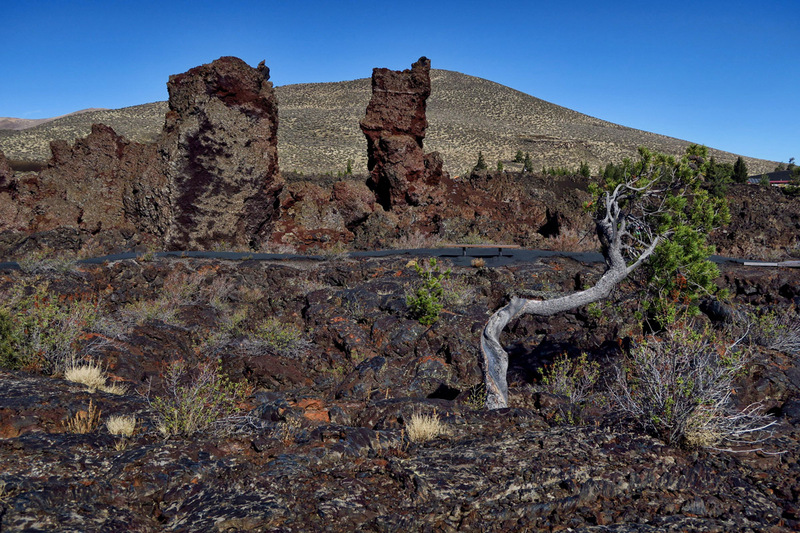 We were lucky to get two of the last remaining sites in the park. The Inferno Cone. It’s a 0.4 mile windy walk to the top. 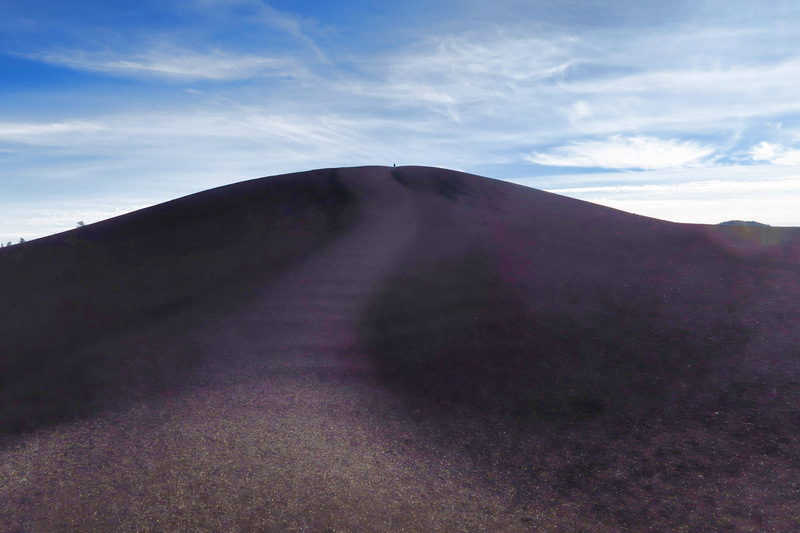 Climbing to the top of the Inferno Cone offers a great view of the Great Rift and Big Cinder Butte. 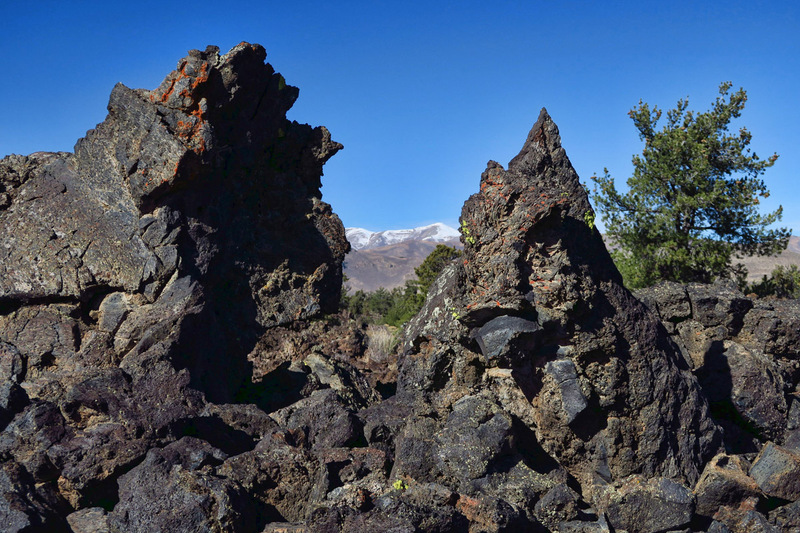 A “spatter cone,” or mini volcano made from blobs of molten lava lobbed into the air. Arch on the side of one of the splatter cones. 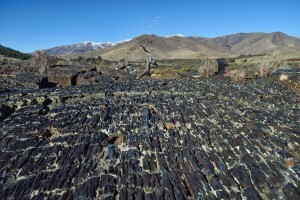 The “cascades,” formed when pāhoehoe lava flowed around `a`a lava. 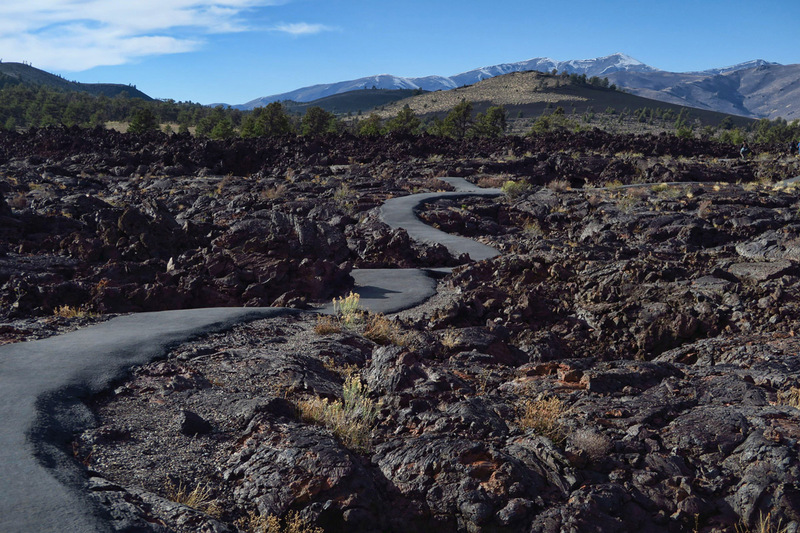 A scenic seven-mile loop road leads out from the Lava Flow Campground, with interpretive walks and kiosks along the way. 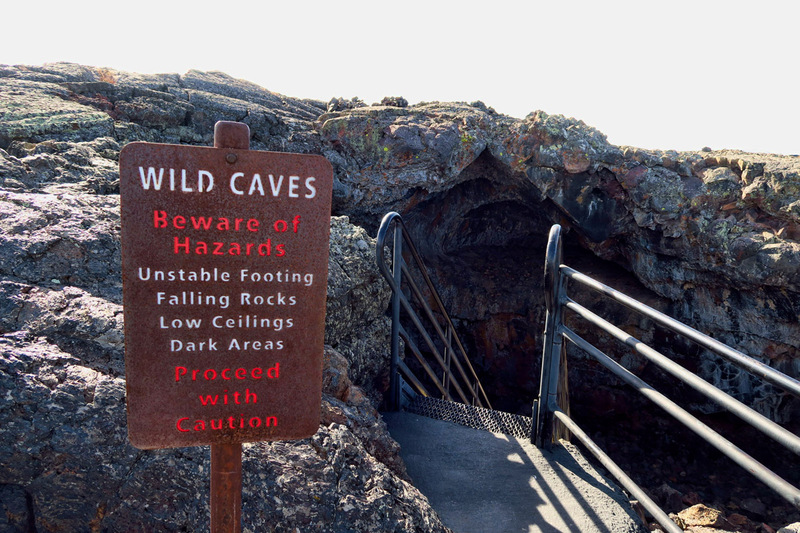 We make the entire loop and all its stops, but none so fun as the “caves.” This requires a permit…you must first to go the Visitor Center and solemnly swear that you have not been in a cave since 2005, and if you have been, you are not wearing the same clothing, carrying the same backpack, camera, etc. And if you are, it must be disinfected. 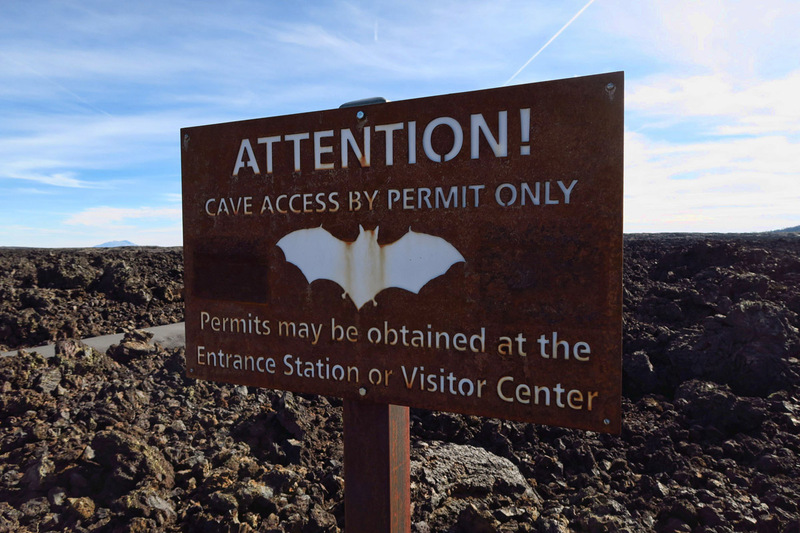 It’s a screening procedure to prevent White Nose Syndrome, a fungus resulting in a fatal condition that’s killed millions of bats since discovery in 2006. This white fungus grows on the nose and wings of hibernating bats, and can be transmitted on shoes and gear from cave to cave. Grateful for whomever laid out these great trails! The Indian Tunnel cave is huge! Thirty ft high, 50 ft wide, and 800 ft long. It requires a bit of scrambling, but it’s possible to traverse the length, exiting out a different hole than you entered. Once we pass the screening, we’re off to explore the Caves Trail. 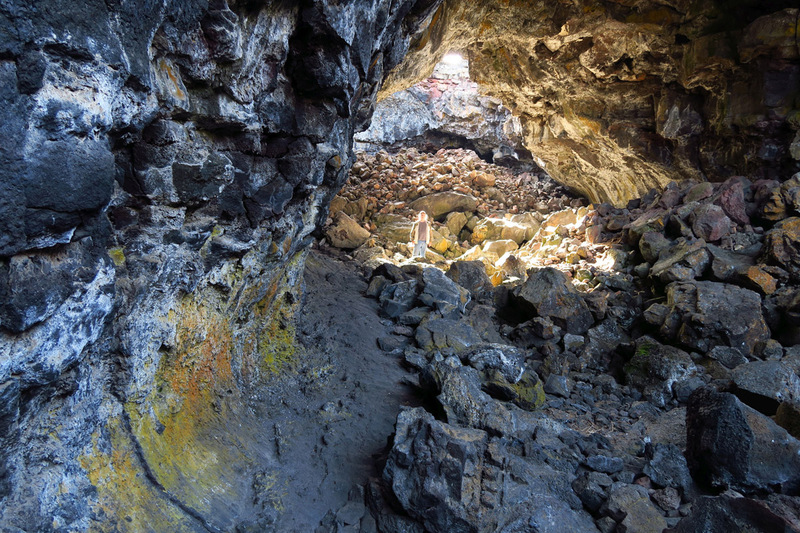 There are four caves, or lava tubes, open for exploration. Two are smaller, but two afford the opportunity to enter into one hole of the tube and exit the other. At the mid point, total darkness ensues, so flashlights are required. 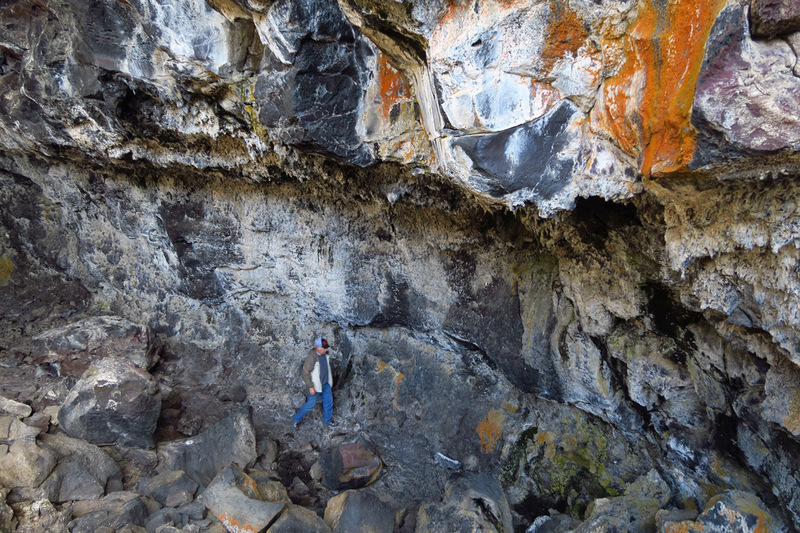 Don doesn’t share my passion for hiking, but he is a good sport to explore the caves with me. 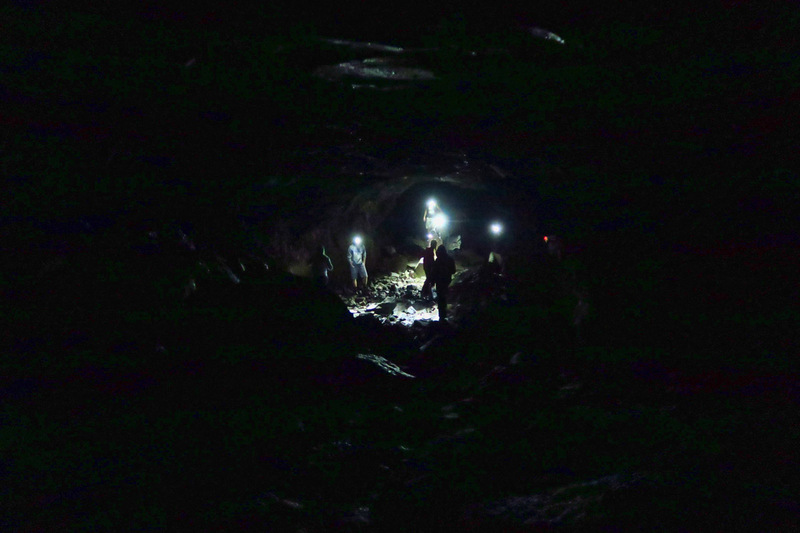 High School Scout Group invades the darkness. As one who has enjoyed underwater caving on over 100 dives, I love the feeling of exploration and mystery of going some place where I really don’t belong….a Stranger in a Strange Land. RIP, Leon, and thanks for the many memories. 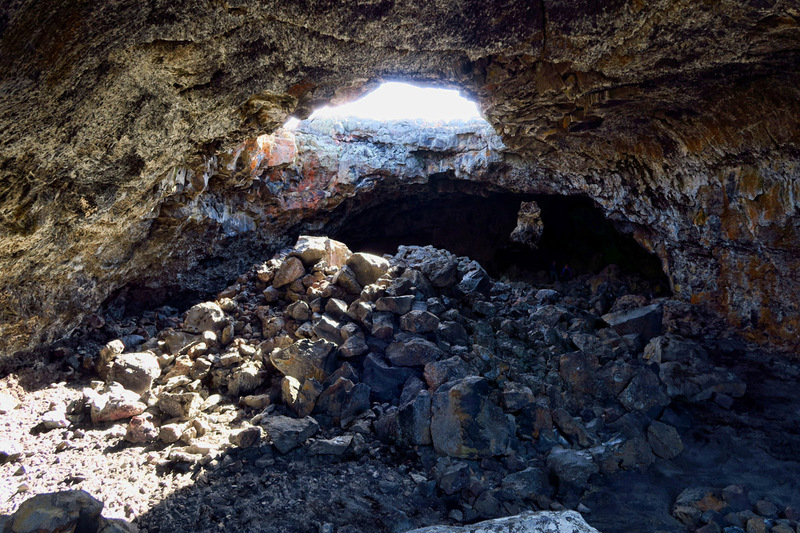 This entry was posted in Idaho and tagged Craters of the Moon National Monument, lava caves, Lava Flow Campground, lava tubes by Suzanne. Bookmark the permalink. I knew as soon as I read your title that some where you would mention Mosat. 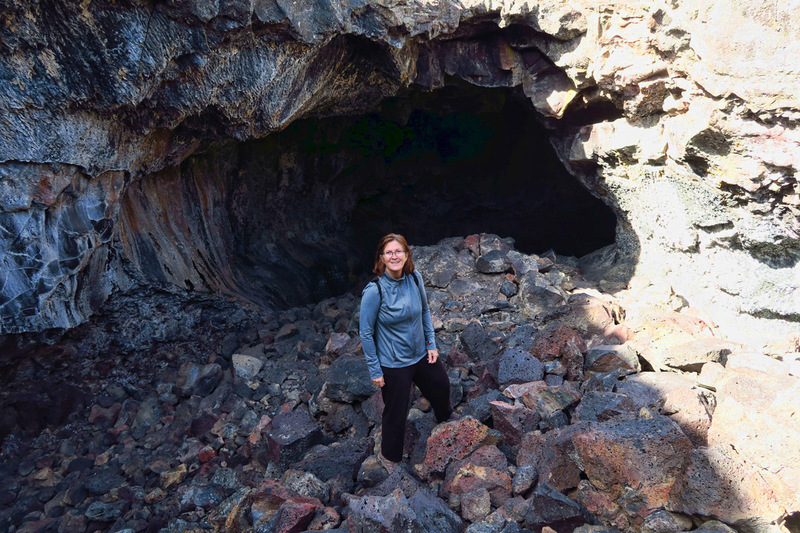 Love the picture of you in front of the cave! 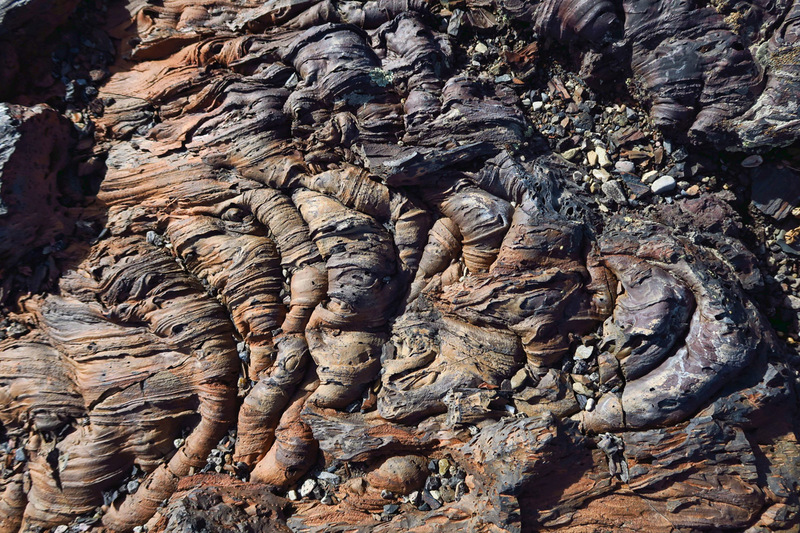 The different colors in the lava surprised me. I was sick Sunday & Monday but I don’t know how I missed the news on the loss of Leon Russell. Such a tragedy, he will be missed. 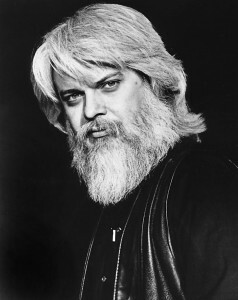 Hi, Suzanne – I really enjoy all your references to artists and poets and photographers and songwriters, etc. Thank you for all your wonderful photos and descriptions of where your travels take you. I am learning quite a bit. I am always amazed at how such bleak and dark land can be so beautiful. 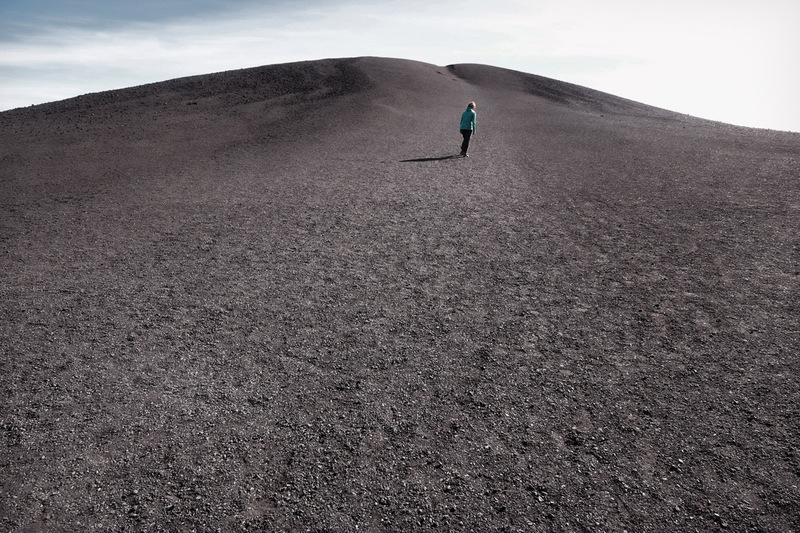 A strange place, when you said that there is no volcano I had to Google them to find out how they occur. The lava just oozes out of a vent, so there must be a crack somewhere? 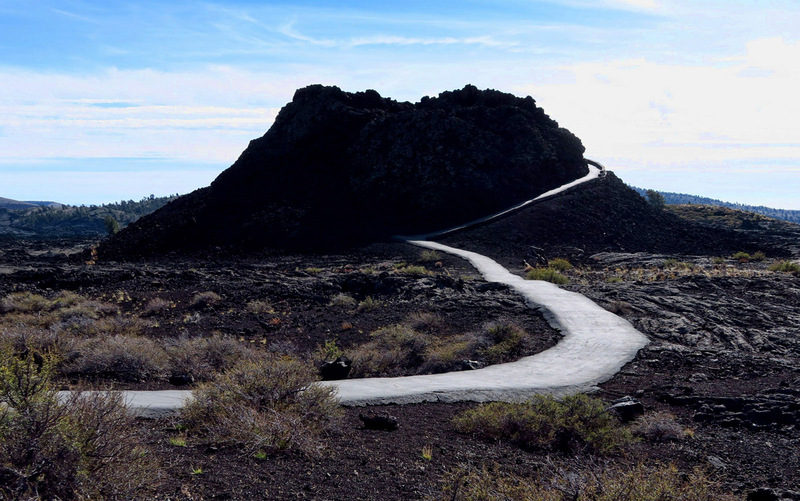 Incidentally one of the best bikes I’ve had was a Kona Cinder Cone!! Ah yes, forgetting the day of the week, a sure sign you are retired! 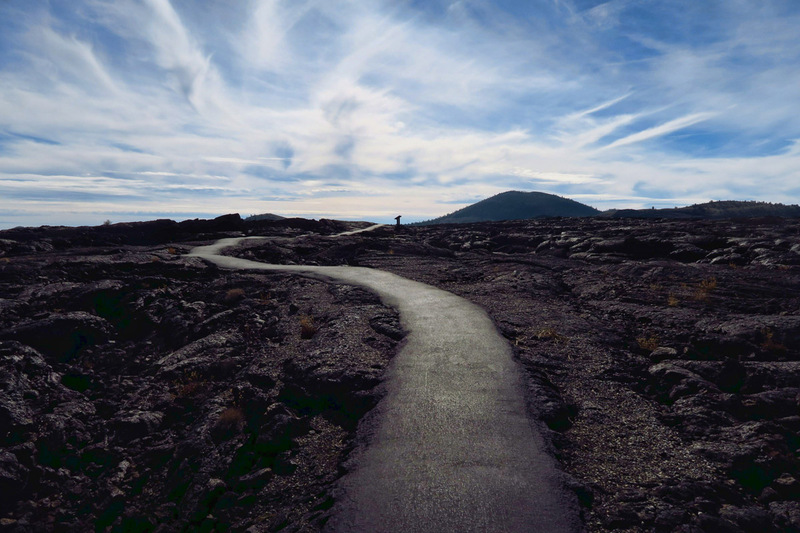 Our ability to travel between such very different landscapes so quickly and so often is one of the most unsettling things about this lifestyle…though not necessarily in a bad way! 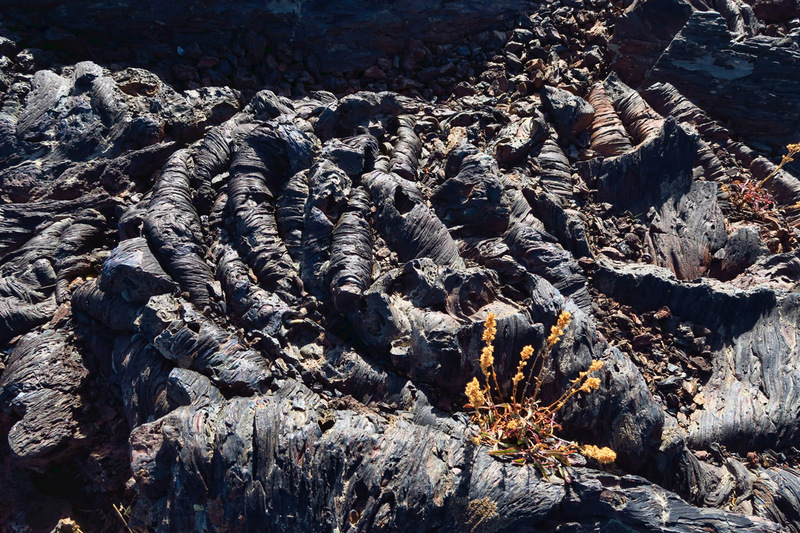 Acres of lava flows are certain other worldly, yet in a very sculptural way. 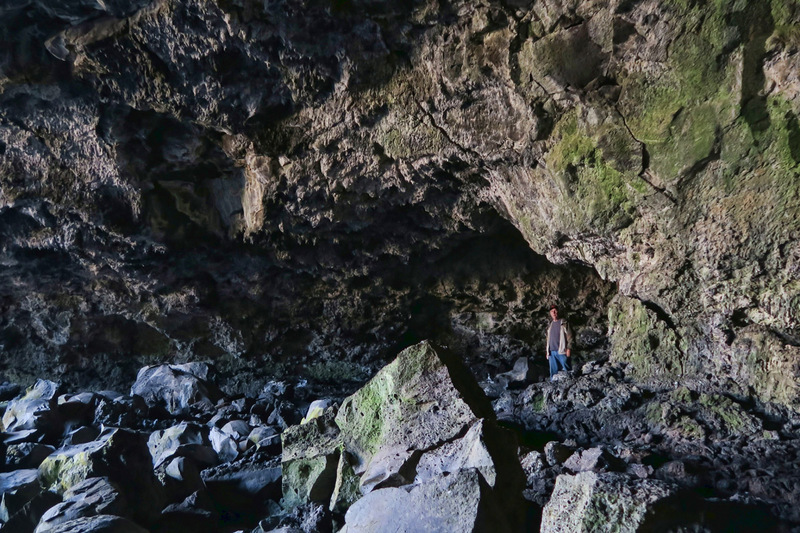 Love to explore the lava tubes but no thanks to underwater caving. Don is a good sport. 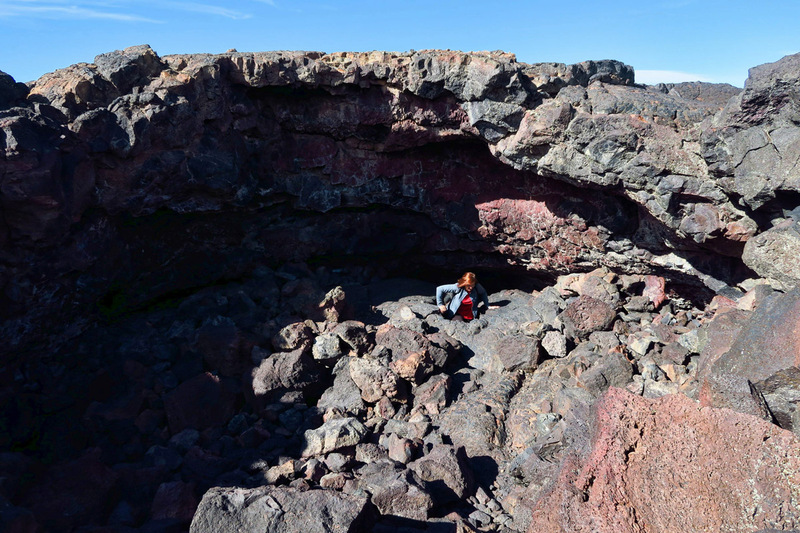 We visited Craters of the Moon a few months ago and the campground was still closed so we just did a drive through and walked a few caves. 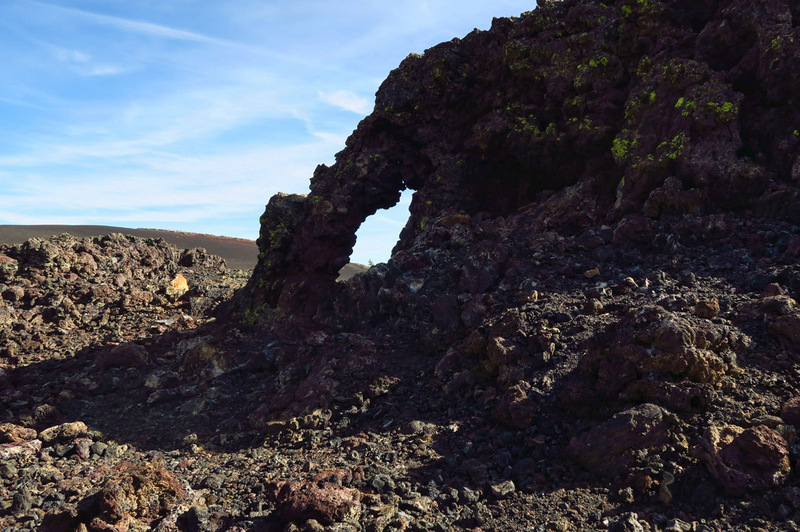 Very interesting area, especially as you said with no visible volcanos.